Non-uniform particle size and inhomogeneous particle size distribution causes severe damages to the polished surface during a CMP process. Ultrasonic dispersion is a superior technique to disperse and deagglomerate nano-sized polishing particles. The uniform dispersion achieved by sonication results in superior CMP processing of surfaces avoiding scratches and flaws due to oversized grains. Commonly used nano-particles with abrasiveness include silicum dioxide (silica, SiO2), cerium oxide (ceria, CeO2), aluminum oxide (alumina, Al2O3), α- and y-Fe203, nanodiamonds amongst others. In order to avoid damages on the polished surface, the abrasive particles must have a uniform shape and narrow grain size distribution. The average particle size ranges between 10 and 100 nanometers, depending on the CMP formulation and its use. Ultrasonic dispersing is well-known to produce uniform, long-term stable dispersions. Ultrasonic cavitation and shear forces couple the required energy into the suspension so that agglomerates are broken, van the Waals forces overcome and the abrasive nanoparticles uniformly distributed. With sonication it is possible to reduce the particle size exactly to the targeted grain size. By uniform ultrasonic processing of the slurry, oversize grains and uneven size distribution can be eliminated – ensuring a desired CMP removal rate while minimizing the occurrence of scratches. Before and after sonication: The green curve shows the particle size before sonication, the red curve is the particle size distribution of ultrasonically dispersed silica. Ultrasonic mixing and blending is used in many industries to produce stable suspensions with low to very high viscosities. In order to produce uniform and stable CMP slurries, the abrasive materials (e.g silica, ceria nanoparticles, α- and y-Fe203 etc. ), additives and chemicals (e.g. alkaline materials, rust inhibitors, stabilizers) are dispersed into the base liquid (e.g. purified water). In terms of quality, for high performance polishing slurries it is essential that the suspension shows long-term stability and a highly uniform particle distribution. Ultrasonic dispersing and formulating delivers the required energy to deagglomerate and distribute the abrasive polishing agents. Precise controllability of the ultrasonic processing parameters give best results at high efficiency and reliability. 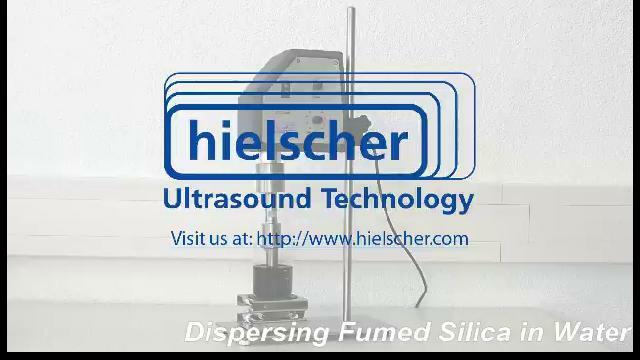 Hielscher Ultrasonics supplies high-power ultrasonic systems for the dispersion of nano-sized materials such as silica, ceria, alumina and nanodiamonds. Reliable ultrasonic processors deliver the required energy, sophisticated ultrasonic reactors create optimal process conditions and the operator has precise control over all parameters, so that the ultrasonic process results can be tuned exactly to the desired process goals (such as grain size, particle distribution etc.). One of the most important process parameters is the ultrasonic amplitude. Hielscher’s industrial ultrasonic systems can reliably deliver very high amplitudes. Amplitudes of up to 200µm can be easily continuously run in 24/7 operation. The capability to run such high amplitudes ensure that even very demanding process goals can be achieved. All our ultrasonic processors can be exactly adjusted to the required process conditions and easily monitored via the built-in software. This ensures highest reliability, consistent quality and reproducible results. The robustness of Hielscher’s ultrasonic equipment allows for 24/7 operation at heavy duty and in demanding environments. Mondragón Cazorla R., Juliá Bolívar J. E.,Barba Juan A., Jarque Fonfría J. C. (2012): Characterization of silica–water nanofluids dispersed with an ultrasound probe: A study of their physical properties and stability. Powder Technology Vol. 224, 2012. Pohl M., Schubert H. (2004): Dispersion and deagglomeration of nanoparticles in aqueous solutions. Partec, 2004. Chemical-mechanical polishing/planarization (CMP) slurries are used to smooth surfaces. The CMP slurry consists of chemical and mechanical-abrasive components. Thereby, the CMP can be described as a combined method of chemical etching and abrasive polishing. CMP suspensions are widely used to polish and smooth the silicon oxide, poly silicon and metal surfaces. During the CMP process, the topography is removed from the wafer surface (e.g. semiconductors, solar wafers, components of electronic devices). 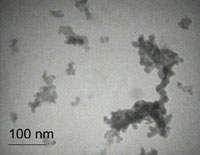 In order to obtain a long-term stable CMP formulation, surfactants are added to keep the nanoparticles in homogeneous suspension. Commonly used dispersing agents can be cationic, anionic, or nonionic and include sodium dodecyl sulfate (SDS), cetyl pyridinium chloride (CPC), sodium salt of capric acid, sodium salt of lauric acid, decyl sodium sulfate, hexadecyl sodium sulfate, hexadecyltrimethylammonium bromide (C16TAB), dodecyltrimethylammonium bromide (C12TAB), Triton X-100, Tween 20, Tween 40, Tween 60, Tween 80, Symperonic A4, A7, A11 and A20.